Virtual DJ Home is a complete music mixing application for your desktop, allowing you to dump your vinyl turntables for a laptop. Looking like a classic DJ set-up, with a mixer and two decks, Virtual DJ will be instantly accessible to DJs and newcomers alike. 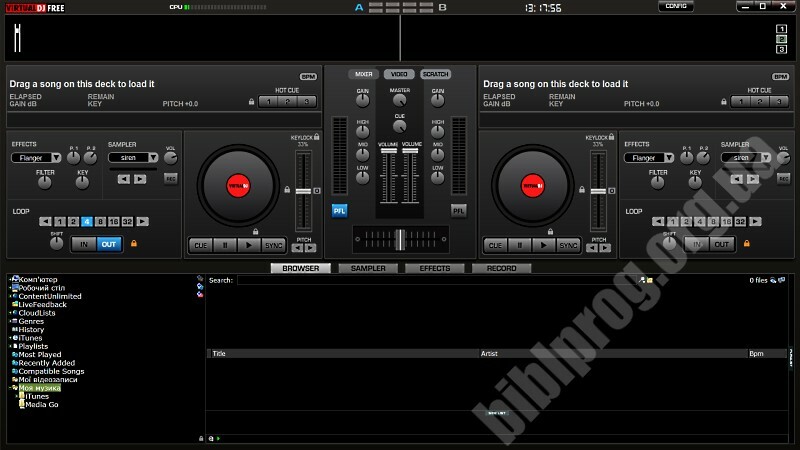 Virtual DJ's interface is complex, organized in such a way that it allows you to work with multiple tunes at the same time and thus get the most out of your talent. From one interface, you get standard controls, pitch controls, a BPM calculator, a virtual scratch and a dynamic beat visualizer. - DJ Players with Controls and Pitch. - Internal Mixer with Gain and Equalizers. - Automatic Beatmatch and Gain. - Smart Loops and Sampler. - Play Music Video and Karaoke. - Record your mix on MP3, CD or internet radio. Harmonic mixing made easier with Match Key button in default skin, autokey limited to 1 semitone changes and browser view making it easier to find harmonically compatible songs. Cue points always instant play on motorized jog controllers. Auto-update browser when key changes. Pads, mappers and filter folders included in database backup. Add key selection and key matching modes to sample editor.